This guide will answer many of the questions you may have if you require diagnostic, medical, surgical or emergency care at the Weill Cornell Brain and Spine Center at NewYork-Presbyterian/Weill Cornell Medical Center. We understand that this can be a confusing and overwhelming experience for patients and their loved ones. That is why we place great importance on being a "family-centered" facility. Our staff is committed to providing outstanding and compassionate care to each and every one of our patients, and is also sensitive and responsive to the issues facing their families and support network. Knowing as much as possible beforehand can help ease stress. 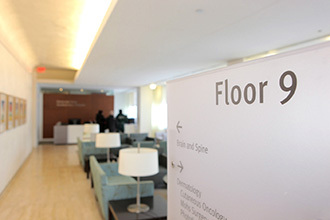 This guide will provide basic information about the Weill Cornell Brain and Spine Center and help you understand our facilities before your appointment or procedure, whether it is for outpatient services or inpatient care. Please use the online phone directory to find your doctor's office phone number. NewYork-Presbyterian Hospital/Weill Cornell Medical Center is world-renowned for the expertise of its physicians and surgeons and the excellence of its clinical services. Every year, thousands of our patients receive medical and surgical care from our outstanding physicians through the hospital's comprehensive outpatient services. The Weill Cornell Brain and Spine Center has several locations throughout New York, making it more convenient for you to see one of our doctors. Our main campus is on the upper east side of Manhattan, but some doctors also have office hours in Lower Manhattan, Brooklyn, and Queens. See a list of our locations. See Preparing for Your Appointment for more information. Click here for helpful pages on the NewYork-Presbyterian site with hospital information from admission to recovery. There you will find answers to your questions about a wide range of topics including meals, television, visiting hours, and services such as Patient Relations and Pastoral Care that accommodate the many practical and emotional needs of our patients and their families. Please follow the links below for more information about making an appointment, how to prepare for an appointment, how to prepare for surgery, and more.